The latest version of InfiniteTTT is 0.6 (Release Announcement) and is available for Windows and Linux. Currently there are no binary packages for other Linux distributions, but they will be added as time permits (help will be appreciated). In each turn the player marks one of the cells of the board, by clicking on it. In order to mark a cell it must be free, e.g. not marked by the other player or by you. An additional requirement is that you must place your mark adjacent to another mark that exist on the board. Adjacent can be vertically, horizontally or diagonally any other marking. 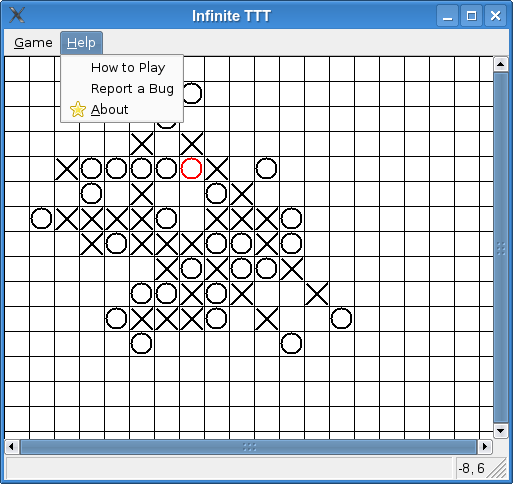 The game in played on an unbounded board, this means that once a player reaches the board’s border, an additional row (or column) is automatically added, and thus expands the board. This means that one can never place a mark at the edge of the board, as there isn’t such. I welcome all kinds of feedback, so if you have one please contact me. Don’t hesitate sending me bug reports, feature request and even general support inquiries about the game.